My reluctance to re-read blurbs before beginning a book pays off again! 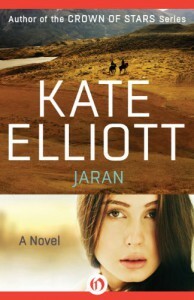 I had no idea what to expect from Jaran, except that I love Kate Elliott's writing and was looking forward to reading some science fiction by her (having previously only read the Crossroads books). Jaran begins slowly, a little too slowly for me, but develops into a beautifully complex and engaging novel that had me eagerly reading way past my bed-time!The most fascinating aspect of this novel, for me, is the jaran culture. Largely tribal and nomadic, women are placed uncommonly high in the social structure and possess the power to choose lovers, take in children, and are the leaders of each tribe. However, the men are powerful in matters of war and travel, and can take spouses (an important distinction here, women choose their lovers, but men choose wives). I was immediately intrigued by their culture, and although I feared Elliott wouldn't be able to resist politicizing this non-traditional structure, I found that it wasn't so. Tess comments on the differences in the ways jaran look at life - men shouldn't flirt openly, the sun is called She and the moon He - but readers are ultimately left to discover the pros and cons of this society on their own.Balanced against this culture is Tess, who has grown up in a more ... for lack of a better word, Westernised culture, and initially struggles to understand the freedom and power she has as a woman with the jaran. I admire Tess' determination and stubborn nature, but quickly grew weary of her tears and blushing. It isn't so much that I thought her weakened by those displays, but that I couldn't understand the impulses behind them. Tears appeared not only when she was sad or angry, but when she was tired, when things didn't go her way, and a few times, for no discernible reason at all. Additionally, while it was clear that Tess isn't a stranger to intimacy between a man and a woman, she's prone to blushing at every joke and insinuation. Which I could have understood, if she hadn't also assimilated that particular aspect of jaran culture. It seems contradictory to me that she (rightly) revelled in the power she had to choose lovers, and enjoy them, and then felt the need to blush and demure every time intimacy was mentioned.I love the secondary characters in the book almost as Tess and Ilya - especially Sonia, Kirrill and Yuri. They are all well-rounded, and I feel we get to know them quite well. In particular, the Chapalii are really interesting - so different and alien in the truest sense of the word, and I would like to get to know more about them in future books.Yuri in particular struck an accord with me because of his kindness, humour and attempts at wisdom, but I think the author's insistence in stopping the action and then having Tess proclaim, rather cheesily, Yuri as he brother, distracting and unnecessary. Although by the laws of the jaran Yuri is certainly her brother, and Ilya her cousin, Ilya's being Tess' cousin is really only mentioned when she has to remind herself why emotional entanglement with him would be wrong. In other words, I am uncomfortable that Elliott felt the need to point out, so early in the novel, that Yuri wasn't going to be a love interest. The insinuation, I feel, is that men and women can't just be friends. This is challenged throughout the book, with Tess forming meaningful friendships with the jaran and not feeling the need to sleep with them, but I still wonder at how the 'Yuri is her brother' aspect is handled.I was interested to note that after the initial adventure on a space-ship, the science fiction elements of the novel were played down. In fact, much of the book reads like fantasy, with the jaran on a long, epic journey across deserts to uncover ancient shrines and temples all Indiana Jones like. I also think that the balance between the romance in the book and the rest of the novel is handled well, and although there are strong romantic subplots, the politics, action and emotional aspects don't suffer.A science fiction novel with amazing twists, Jaran has certainly hooked me for the rest of the series. Although this first book was initially published in 2002, the series is being re-released in 2013 as ebooks by Open Road Media, and you can bet I'll be getting the other three books! I'm keen to get to know Tess and Ilya better, so see the impact they have on the future of the Jaran, and to see what role they play in the inevitable rebellion against the Chapalli. 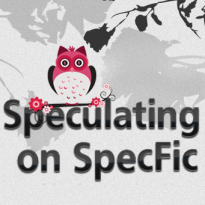 I recommend this novel to fantasy and science fiction, because it really has something for everyone.A copy of this book was provided by the publisher for review.You can read more of my reviews at Speculating on SpecFic.